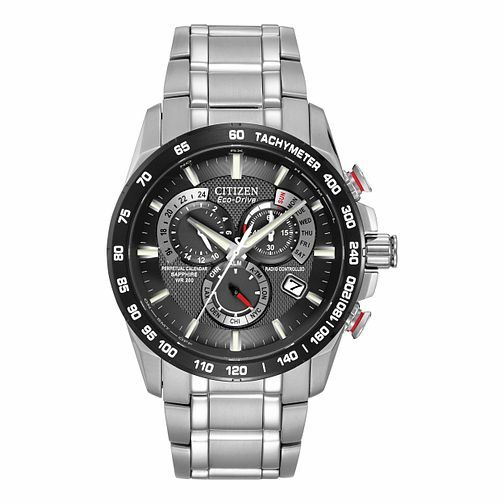 Citizen Eco-Drive stainless steel men's watch. The Citizen Perpetual Chrono A.T features Radio-Controlled Atomic Clock Synchronisation in 5 time zones for superior timekeeping accuracy, powered by Citizen’s award-winning light-powered Eco-Drive technology it never needs a battery. This watch has alarm functionality. Citizen Eco-Drive Men's Stainless Steel Bracelet Watch is rated 4.0 out of 5 by 1. Rated 4 out of 5 by Anonymous from Pricey but great Got one for Xmas. Awesome piece. As long as you don't mind spending more.